The city of Hangzhou runs the largest bikeshare program in the world. Photo by David Tubau. The Beijing Municipal Government recently launched a new public bike rental program, though this is not Beijing’s first foray into bike sharing. There are 39 public bike schemes in China—dwarfing all other nations. As more Chinese cities introduce public bike systems, we need to think carefully about their design and operations under a broader sustainable transport framework. There has been a boom of shared and public bikes in cities around the world. From Paris to Washington D.C., from Barcelona to Boston, shared bicycle fleets have been branded and introduced in modern cities as a “new” member of mass transit. China, once called the “Kingdom of Bicycles,” is also sparing no efforts in promoting public bikes. The attention for pubic bikes in China is partially related to the success of the Hangzhou public bike program. Currently, Hangzhou runs the largest bikeshare program in the world with 250,000 trips a day with more than 60,000 bikes and 2,177 stations. This system, which is funded entirely by the municipal government, was planned and built within only three years The red bicycles have been so well-received by the public that it inspired many other Chinese cities, including Beijing, to replicate the Hangzhou model. On June 16, the Beijing municipal government launched its public bike program. The first batch of 2,000 bikes have been stationed in 63 places with high-traffic flow in Beijing’s Dongcheng and Chaoyang districts. According to the plan, 50,000 bikes will be in use in 1,000 designated service places by 2015 to cover major districts, transportation hubs and streets. It is widely recognized that Hangzhou’s success is attributed to its good planning and design. Laying out a new public bike network is not an easy task, from putting bike stations in the right places to providing well-connected bike lanes. Hangzhou carefully considers the density and service radius of its bike stations. The average station distance is about 1,000 meters, which makes the public bike an accessible last- or first-mile solution. Hangzhou’s bike program also has an incredibly beautiful and bikable open space in the city center, starting with the famous West Lake scenic area. These factors contribute to the popularity of Hangzhou’s public bike system. Beijing seems to be spending some—but not enough—efforts on planning and design. According to Beijing’s transportation plan, the city will provide bike-exclusive lanes in historic centers, arteries and central business districts by 2015, leaving the capital still three years for real implementation. It is also said that the largest station distance would not exceed 3,000 meters, which is about a 40-minute walking distance, not ideal enough for public bikes being the last- or first-mile solution. Other than station and bike lane planning, integration with other public transit modes is also crucial. In Hangzhou, the planning of its bike stations is consistent with its public transit system, where the large bike stations (with 80 to 140 bikes) are placed at important transit nodes, and median bike stations are found at bus stops (10 bikes per thousand residents.) This integration allows people to easily transfer from bikes to public transit. For new bus rapid transit or metro line projects, integrating bikeshare infrastructure is only a very small additional investment that could yield great social benefits, as shown in the case of the Guangzhou BRT and Guangzhou bikeshare. While Beijing continues its efforts to build new metro and bus lines, taking the public bike into account might be a good way to go. A key feature for Beijing’s bike program this time is that it is “public,” led by the Beijing government, and it is almost free, like Hangzhou (the first hour is free and the rate for extra rental time is 1 yuan per hour.) However, in terms of financial sustainability, the Hangzhou model is not that perfect for Beijing to copy. Hangzhou’s public bike program is “government-invested, enterprise-operated,” where the “enterprise”—the Hangzhou public bike company—is in fact a state-owned company. Since the rental revenues and advertisement income does not cover operational costs, the public bike system in Hangzhou runs on a governmental subsidy. Public bikes might be a sweet burden for local governments, but more sustainable and innovative models could be developed, such as the program in Wuhan, China. The public bike program in Wuhan is a point collecting system and it is free and accessible for everybody. But to many people’s surprise, this system was set up and operated by the private sector. Instead of being directly involved, the Wuhan government grants the station advertising and development rights to the operators, and the operators obtain revenues from advertisements to pay for the construction and management of public bicycles. Coincidently, when Fangzhou, the former largest private bikeshare company in Beijing, closed its business in 2010, the owner told reporters that the company would have survived if the Beijing government could grant them the advertisement rights for their bikes and bike stations. 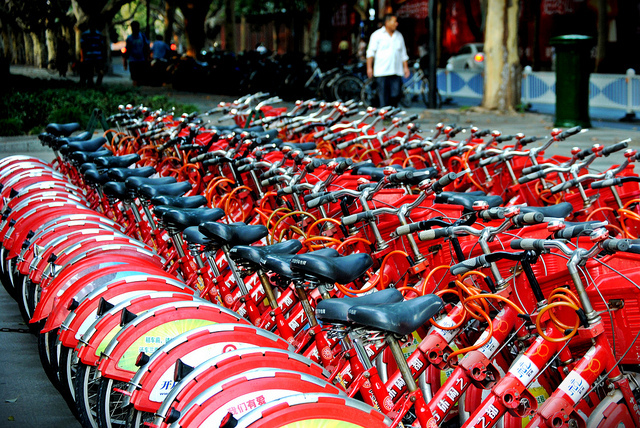 Though the Wuhan bikeshare program currently suffers from some problems like vandalism, its operations and funding model, through advertising rights, is still informative for other cities looking to adopt a similar scheme. Public bike systems are not insignificant; they are a reflection of local urban planning and design capacity, and they also mirror local governance. On the other side of the world, New York City also launched its long-awaited bikeshare program. For that, the city developed a 142-page report to study its feasibility. The privately funded bikeshare program announced that it will include 10,000 bikes and 600 stations, at no cost to taxpayers. For now, it is great that Chinese cities are showing such a strong commitment to introducing public bikes to its citizens. Still, more further studies are needed in the future on the financial and operational models, station planning, and mass transit integration.